Organic corn, non-GMO, is prone to attack from worms. This is not really a problem. The worms are not dangerous, they just like corn kernels as much as we do. When you take the husk from the corn you tend to see a trail of munched kernels. Just remove the worm if it is are still there and carry on. Frog Song must have had a bit of an infestation this week because our corn came pre-husked and trimmed. Even so there was an occasional missing kernel. So it was not the perfect corn cob, to be briefly boiled, slathered in butter and eaten. What to do? Stripping the kernels from the cobs leaves you with a lovely pile of fresh, crunchy, kernels. There are a thousand ways to prepare corn kernels. 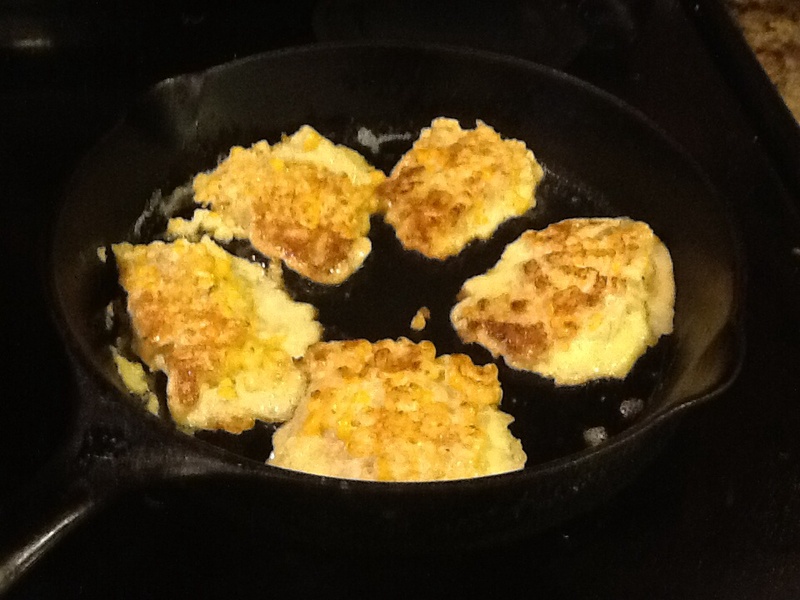 One of my favorites is corn fritters. 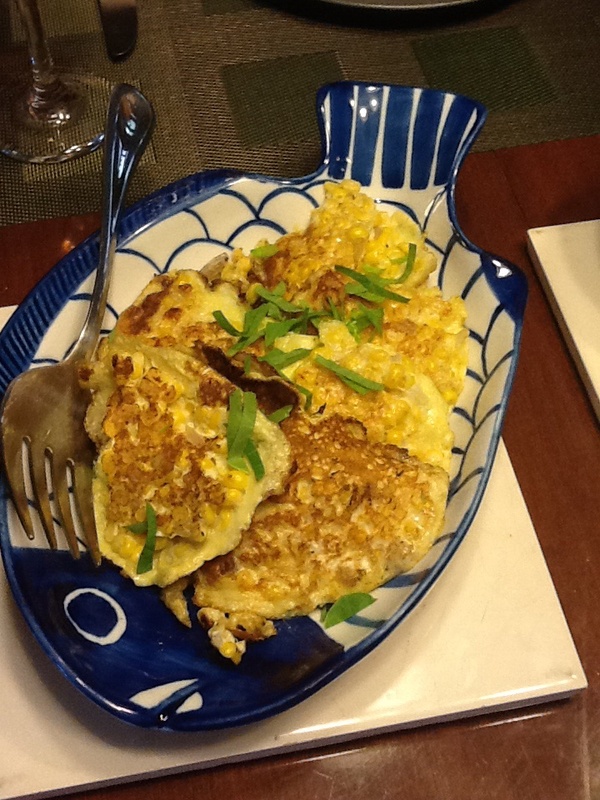 The sweetness of the butter and the creaminess of the eggs both amplify the same qualities of the corn. Half a small onion, diced. Corn kernels from about four cobs. Melt the butter in a skillet until it foams. Mix the corn into the eggs with the onion and seasoning. Place large tablespoonfuls of the mixture in the hot skillet. You will probably have room for four or five. Don’t crowd them. As the egg sets and you see the edges beginning to brown, turn them once and brown on the other side. About three minutes per side. Lift from the skillet and place in a warm serving dish. Continue with the remainder of the mixture until finished. Mine made seven fritters. Garnish with papalo, or parsley if you have either. Lett’s talk a bit more about Genetically Modified Organisms (GMO.) I am not opposed to GMO food. Humans have been genetically modifying food, both animal and vegetable, since the Neolithic agricultural revolution. I see no reason to stop now just because we are using new genetic techniques for doing so. We have seven billion people (and growing) on this planet to feed and we have to do so in a sustainable way that does not have too much of a negative impact upon the environment. If GMO crops can reduce the use of herbicides or pesticides, increase yields, or create varieties able to survive and thrive in what had been adverse temperature and moisture conditions; great. Go for it. I also think the health concerns about GMO foods are bogus. etc. In my day job, as an information professional, I am a proponent of open access (providing access to information at no cost of the end user and in ways that enable information to be used, reused, and modified at will.) I think we also need to be as open with seeds. So that farmers can collect seeds and sow them the next season, can modify them, and so that governments and others can create generic GMOs, as they can with generic drugs (that are no longer patented.) if we don’t do this, I worry that we give too much power to transnational agribusiness corporations. My new favorite way to cook amaranth leaves. This is another variation on a Fuchsia Dunlop recipe from Land of Plenty. Amaranth, all ready to go. Amaranth can be a somewhat fibrous vegetable, so prepping is well worth the time. Nip off the smallest leaves and set aside. Nip the leaves from the petiole at the base, so that the petiole remains on the stem (not sure about your parts of the leaf? See here.) using a paring knife, strip the petioles from the stem pulling them down the stem so that you remove the petiole and some of the fibers from the stem, just like you would peal a stick of rhubarb. Wash everything thoroughly. Amaranth can be gritty as well. Chop the stems in half inch pieces and roughly chop the leaves. Now you are ready to begin. By the way, this prep is pretty much what I use for any amaranth recipe. Here is the recipe. One bunch of amaranth, prepped as above. Four tablespoons of sweet aromatic soy sauce (fu zhi jiang you). Four tablespoons of chili oil. 2-3 cloves of crushed garlic. Chopped papalo (or cilantro) for garnish. Bring a large pot of salted water to boil. In the meantime mix the soy sauce, chili oil, garlic, and sesame oil in a small bowl. Blanch the amaranth for about 3-5 minutes. 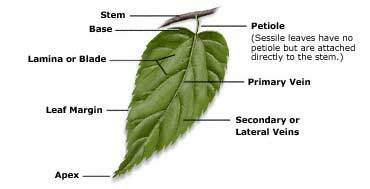 Test a leaf to check if it is cooked. Strain the amaranth from the water. Thoroughly mix the sauce into the amaranth and place in a serving bowl, sprinkle with the papalo. Serve warm. Front; amaranth in hot and garlicky sauce. Back dried fried beans. We had this with dry fried yard long beans (gain bian si ji dou) and we just couldn’t resist traditional corn on the cob with lashings of butter, since it was so fresh. So this was an all-CSA meal tonight. 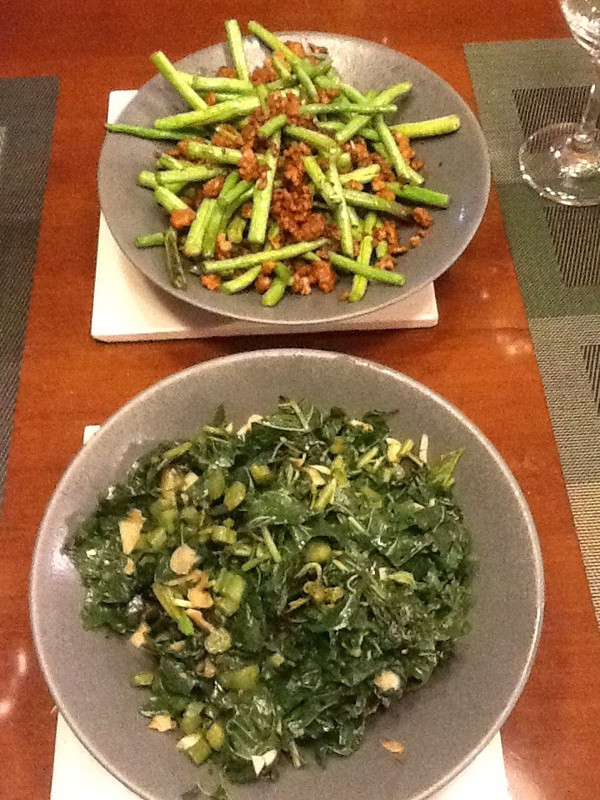 The pork in the beans is just a flavoring and the beans are crunchy, the amaranth is very garlicky and somewhat spicy. All in all a great combination. ll washed down with a Vouvray. * My Chinese is virtually non-existent. So I hope I have this right. Let me know if I need to correct it. More than we expected this week. We got more than we expected this week. 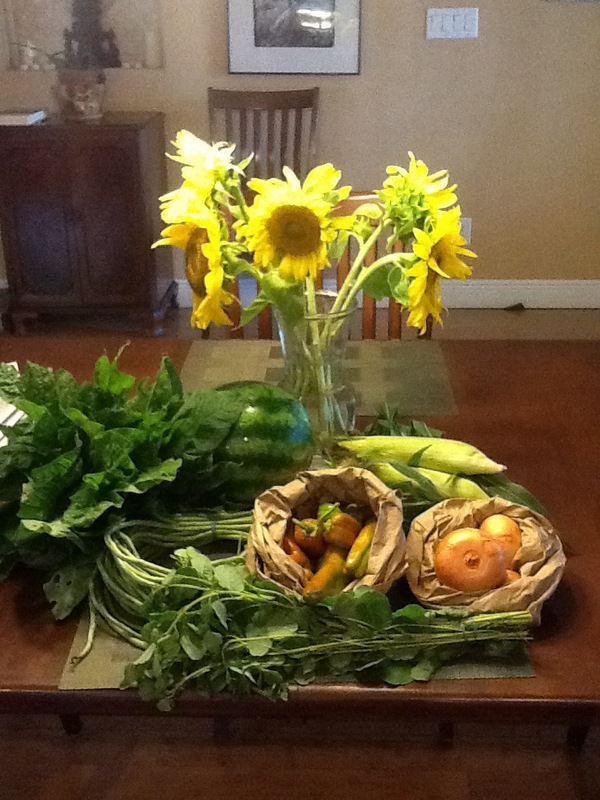 Amaranth, sweet corn (John threw in a couple of extra ears), sunflowers, sweet onions, sweet peppers, yard long beans, and papalo, but also another gorgeous watermelon and some nice complements on the blog from the good folks at Frog Song. That papalo is definitely the most intriguing. I am going to have to do a whole post on that. Anyone have any ideas how to use it? Clockwise from the sunflowers, sweet corn, sweet onions, papalo, sweet peppers, yard long beans, amaranth, and watermelon. 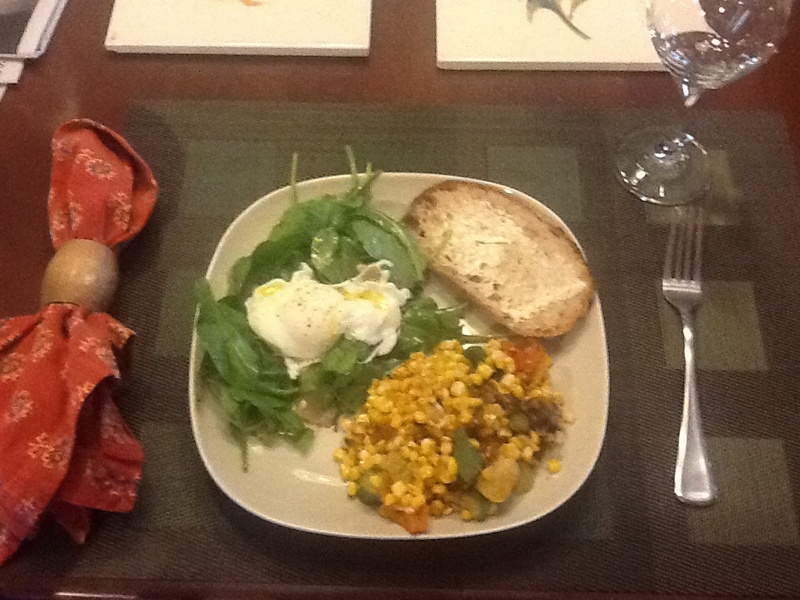 As everybody knows, succotash is a Native-American dish made largely from corn and beans. So we brought a couple of ears of sweet corn (Bethany was not sure if it was Georgia or Florida corn, but hey) and we headed home for lunch. Here is the recipe. Garlic and Lima beans are in the pot, we are ready to go. 2 ears of corn, shucked. As many Lima beans as you can gather from the garden. Only a dozen in our case. Half a dozen grape tomatoes, quartered. 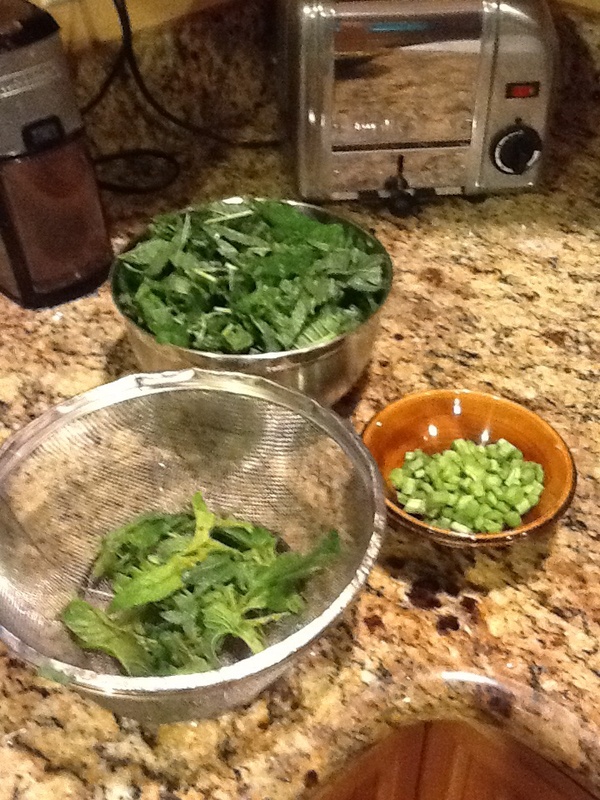 Half a dozen okra, chopped into rounds. Two sweet peppers, roasted, seeded, and chopped. Olive oil and salt and paper to taste. Sauté the garlic in the oil over a medium heat until you can smell it. Add the fresh Lima beans and enough water to cover them. Boil the water away. As the water evaporates add the thinly sliced onion. As the onion softens, add the tomatoes. 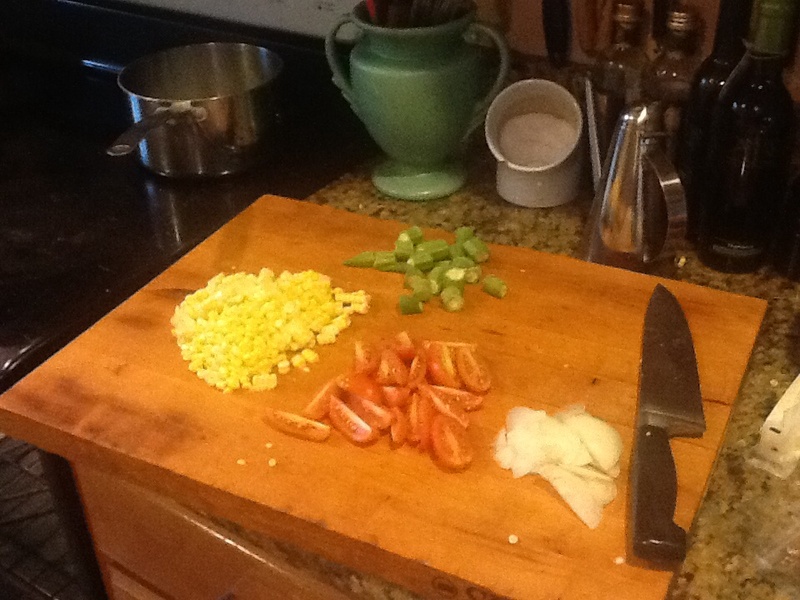 As the tomatoes soften add the corn and then the okra. Add the roasted and chopped peppers. 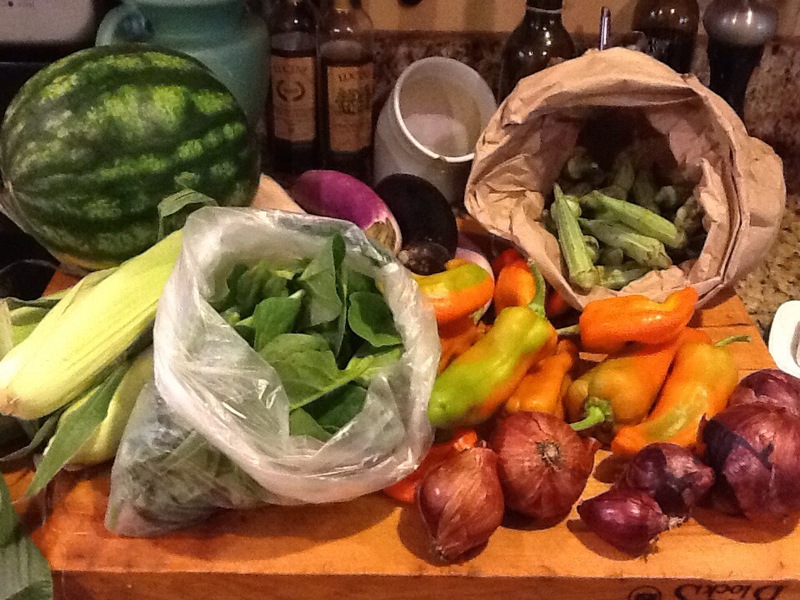 Cook only until the corn and okra have cooked through. The okra will turn bright green. Add salt and pepper to taste. I like to finish it with a splash of good olive oil from Ancient Olive ( a Spanish Pichual) and a sprinkle of sea salt. With an arugula salad (from Frog Song) dressed with good shaved reggiano cheese and a poached egg from Lake Meadows Farms, and a slice of Olde Hearth’s whole wheat levain bread, this makes a lovely lunch. This pairs well with our favorite rose wine.